J.V. 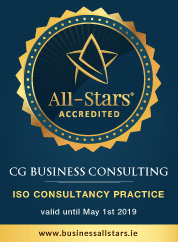 Tierney & Co. Ltd.
CG Business Consulting Ltd and particular Caroline Geoghegan met Hegarty Demolition Ltds certification requirements for ISO 9001, ISO 14001 & OHSAS 18001 in a quick and efficient timeline in which no other Consultant Body could meet or deliver. Their understanding of our sector, pragmatic approach and the tangible feedback from the detailed audit reports were invaluable in implementing these systems into our Organisation. We therefore have no hesitation in recommending them to further prospective clients. Caroline was a true professional, working with each department and guiding us through the entire process from start to finish to ensure that the changes to our internal team didn’t mean any unwelcome consequences in relation to meeting our audit requirements. The teams expert knowledge of ISO 14001 implementation was a clear advantage to us, and ensured we achieved what we needed to in a very short space of time. I would highly recommend Caroline to anyone going through the ISO process, they certainly helped make our journey easier. Find out more about Toyota Ireland.